Valued for its low acidity and produces exciting and long lasting wines if yields are kept low. It adds ‘body’ to blended wines. Also grown in Alsace, where it is usually blended into ‘Edelzwicker’, and found in Luxembourg, Burgundy, Canada, New Zealand and USA. As a neutral Pinot Blanc/Chardonnay style variety it is also useful for barrel ageing or as a sparkling wine base. (Silvaner x Riesling) x Muller-Thurgau Its grapes have a strong and distinctive aromatic flavour, with high sugar content. It is regularly made into a single varietal wine and although common in Germany it is also very successful in this country. Some wines produced from this grape develop good New World Sauvignon Blanc characters. When riper, tends towards Sancerre. Well made Bacchus wines age well and develop interesting flavours. This is one of the UK’s better varieties, capable of producing world-class wines. Third most widely planted variety in UK. Now the most widely planted variety in Great Britain, Chardonnay is grown largely as a fundamental ingredient of the finest sparkling wines, with plantings on the increase, along with Pinot Noir and Pinot Meunier, for production of sparkling wine. There also occasionally some gems when produced into still wine. (Pinot Blanc x Müller-Thurgau) Not extensively planted in this country but seems to blend well with Müller-Thurgau. It develops good must weight and, in Germany, can qualify for ‘spätlese’ status. Produces wines that are very fruity with crisp acidity. (Chasselas x Courtillier Musqué) Bred in 1927 in Germany. Has a rather ‘muscat’ style and is a good cropper with good sugar levels. It needs careful management and can be used for dessert wines because of its susceptibility to ‘noble rot’. It has a high natural acidity and strong aromas of elderflowers, producing very fruity wines that age well. (Trollinger (Black Hamburg) x Riesling) Bred in 1929, this is a very successful grape that ripens reliably and produces excellent fruit. It has a style similar to Riesling and is popular in Germany. It may well have a good future in England. A variant, ‘Kernling’ ripens earlier than Kerner but produces virtually identical grapes, with wines that are fruity in a steely, Riesling style. (or Madeleine x Angevine 7672) Designed for northern planting, it flowers late is an early, reliable cropper. It is useful for blending since it ages well and its relative low acidity will blend well with higher acid varieties. On its own it produces wines that are light and fruity with a pronounced muscatty bouquet. Uncertain parentage, though now generally thought to be Riesling x Riesling Bred in 1882. The main grape in Liebfraumilch, and was used in Germany to restore the fortunes of their vineyards after the war but is now seen as bland. This grape was among the first planted in the U.K when grape growing resumed and was the single most widely grown variety for many years. It is now less popular being seen as a producer of unstylish wines. It is popular in central and eastern Europe. A vigorous early ripening variety, but can be a poor cropper. (Silvaner x Riesling) x Müller-Thurgau First registered in the early 1970’s. An early ripening variety that achieves high must weights, and therefore suitable for ‘late harvest’ wines. Hybrid. Optima x Seyve Villard 12-375 (Villard Blanc) Crossing in Germany first registered in 1984. One of a new generation of hybrid varieties bred both for wine quality and disease resistance. Being a recent introduction to the UK it is currently too early to tell whether it has a future. Early reports are encouraging and wines can be fruity and quite aromatic. The increase in area shows that it is achieving some limited popularity. One to watch with interest. Muller-Thurgau x Siegerrebe First introduced to the UK in 1971. This vine suits our climate, although is prone to disease, and is planted widely. It produces very full flavours and high natural sugars and has been used for late harvest wines. When ripe it produces wines that are rich and zesty with good balance. Good for blending with more neutral varieties. Hybrid. Bacchus x Seyve Villard 12-375 (Villard Blanc) A recent cross and one of a new generation of hybrid varieties bred for quality and disease resistance. Currently planted in a few vineyards, but one to watch. Wines from Phoenix are also quite Bacchus-like, sometimes Sauvignon Blanc in character. This is a mutation of Pinot Gris (see below). There are various strains of this grape. The wine has a strong nose and, where planted, seems to ripen its fruit well and produces wine with good and full fruit flavours and crisp acidity. It crops heavily in most years. Can produce a style similar to Chardonnay. Widely grown in France, where its main home is Alsace and known there as Tokay Pinot Gris. It is also grown in Germany, Italy and Switzerland and known by various names including Rülander, Malvoisie and Pinot Beurot. It is not widely planted in the UK, and does not produce such exceptional flavours as found in other countries. 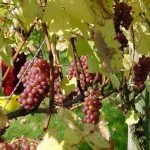 Luglienca Bianca x Early Gamay Proves itself capable of good yields, ripens early with good sugars and relatively low acids – in short an ideal candidate for our climate! Wine quality can be excellent. Muller-Thurgau x (Madeleine Angevine x Calabreser Frohlich) A popular variety in the UK – currently the second most widely grown variety after Seyval Blanc (2002). 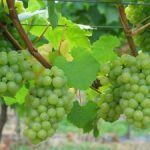 It ripens early and performs reliably, and is capable of producing large crops of relatively neutral grapes, high in natural sugars. It is reliable but a little bland and is often used for blending in both still and sparkling wines, having good sugar levels. Seibel 5656 x Seibel 4986 Developed in the 1920’s in France. Now the most widely grown variety in the UK (2002). It crops heavily in this country, even producing good crops in cooler years, and has effective disease resistance. It is a good ‘all rounder’ – often used for blending, and is well suited to oak aging and used for still or sparkling wines. Single varietal wines offer crisp acidity, with quite neutral flavours. A small berried and intensely aromatic variety. One of its parents was the famously spicy Gewürztraminer grape. It ripens sometimes to excessive levels and has a very dominating flavour. It is often used to bolster blended wines and a few growers use it as a varietal in its own right – some for late harvest and dessert wines. Muller-Thurgau x Gewurztraminer This crossing was developed in 1932. It is not widely planted. An early ripening variety that does not carry a heavy crop and produces quite strong, spicey flavours. It has low disease resistance. Helfensteiner x Heroldrebe Created in Germany in 1955, the product of a long process of vine breeding. Helfensteiner is early Pinot Noir x Black Hamburger and Heroldrebe is Portugieser x Limburger. The wine is notable for its colour and good acidity and grows well in the UK, having been introduced in the 1980’s. In Germany it is quite widely grown and capable of producing some very fine wines. Over here it is one of the grapes that shows that good red wine can be made in the U.K. Wines are usually fresh and fruity more like Syrah or Gamay than Cabernet Sauvignon. Unknown parentage First appeared in UK in mid-1980’s. Few varietal wines are made from it. Its strong point is deep colour, which is useful when blended in with other grapes. Dunkelfelder has fairly low vigour and does not usually run to large crops. On its own, the wine is fairly neutral with low acidity and is best blended with other red varieties. A black grape now planted as an essential constituent of the finest sparkling wines, along with Chardonnay and Pinot Noir, as in Champagne and many other sparkling wine regions. Although it has been grown for over 40 years in the UK (it has been referred to as Wrotham Pinot over here), it has never shone as a variety capable of making interesting wine as a single variety. One of the most ancient and noble of all grape varieties. 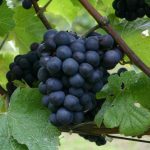 It is the classic grape for red Burgundy but is also an important element of sparkling wines in England – in fact it is now the second most widely planted variety in the UK. It is at home in the English climate and in good years some excellent quality red wines have been made with this grape. It takes new oak well. Hybrid. (Silvaner x Muller-Thurgau) x Chambourcin Another one of the new generation of hybrid varieties bred for wine quality and disease resistance. It is a relatively new introduction to the UK, and those wines produced have shown real promise, with low acidity, high sugar levels and good yields. Hybrid. Saperavi Servernyi x St Laurent Originally just named Gm 6494/5 this hybrid vine has very different parentage from Regent but some similar characteristics. It has adapted to UK conditions very well and plantings have been increasing since was first planted in 1983. Rondo produces wines with very good colour and style and overtones of classic red varieties. It blends well with other varieties (such as Dornfelder and Pinot Noir) and can be likened to a cross between Tempranillo and Syrah. Was known as Triomphe d’Alsace, and initially quite a popular grape in this country. It yields well and ripens early but it has low disease resistance. It has low acidity and high sugar levels and may be superseded by other more recently bred vines.